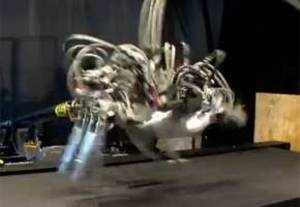 The world’s fastest robot has now left the world’s fastest man behind. Scientists at the world’s oldest vet college, the Royal Veterinary College, have studied the cheetah in the African wild for over five years, to create the world’s fastest robot.Funded by the US military, the Robotic Cheetah has now beaten the fastest man Usain Bolt. Speaking to TOI, RVC’s expert of locomotor biomechanics Alan Wilson said the robot has now clocked 29 miles per hour compared to Bolt’s speed of 27. A real cheetah can clock 70 miles per hour. Robot designers Boston Dynamics look to nature for inspiration for the design of dynamic free four legged robot. Alan’s role in the Cheetah project was to study the animal in the wild and translate the mechanics of cheetah locomotion into engineering principles that can be used by robot designers. Dr Hutchinson adds that the battery on the collar were solar powered which helped scientists follow and study the cheetahs for years without a break. The experts studied cheetahs from several sources - including the wild - high-speed video cameras and motion sensors (attached to collars). For this work the team used a 30 gram GPS inertial measurement unit attached to a collar on the cheetah. The data from the unit gave measures of speed, position, acceleration and orientation. From these measurements angular velocity and acceleration can be calculated during the many twists and turns that the cheetah perform when hunting, the scientists said. Alan who is leader of the Locomotion (muscle, tendon and biomechanics) Research Group, has been awarded a grant of Â£600,000 to study the dynamics and energetics of hunting in the cheetah, in order to identify what enables cheetahs to sprint so fast. The collars monitored where the cheetah is and what it is doing - resting, walking, and most importantly, hunting and only collects detailed information when the cheetah is moving quickly (logging data up to 300 times per second). “From the data, we reconstructed the exact movement of the cheetah during a hunt,” Alan added.